The directive by Iran’s Supreme Cyberspace Council to require social messaging apps to start storing user data in Iran within a year was the result of a majority vote by people directly appointed to the body by Supreme Leader Ali Khamenei, a source told the International Campaign for Human Rights in Iran. Iranian officials have previously made several unsuccessful attempts to convince the owners of social messaging apps to move their servers to Iran, but the Council’s directive is the first instance of a government agency trying to force the demand. If granted, this would allow the Iranian authorities to have access to users’ accounts, a potentially catastrophic development for activists and others who are imprisoned in Iran for online content or communications with which the authorities disapprove. The main target of the directive from May 29, 2016 appears to be Telegram, which according to its CEO and co-founder Pavel Durov has 20 million users in Iran, making it by far the country’s most popular messaging app. Unsuccessful attempts to censor content on Telegram have frustrated Iranian security agencies and angered hardliners. The Supreme Cyberspace Council is the country’s highest policy making body on matters related to the Internet. The president is its chairman but has little or no influence on its decisions. Its current members, including new appointments by Khamenei in September 2015, have taken a harder line than their predecessors and have demanded all “parallel” organizations cease making decisions. Of the council’s 25 members, 17 are representatives of various government institutions and eight are directly appointed by the supreme leader. 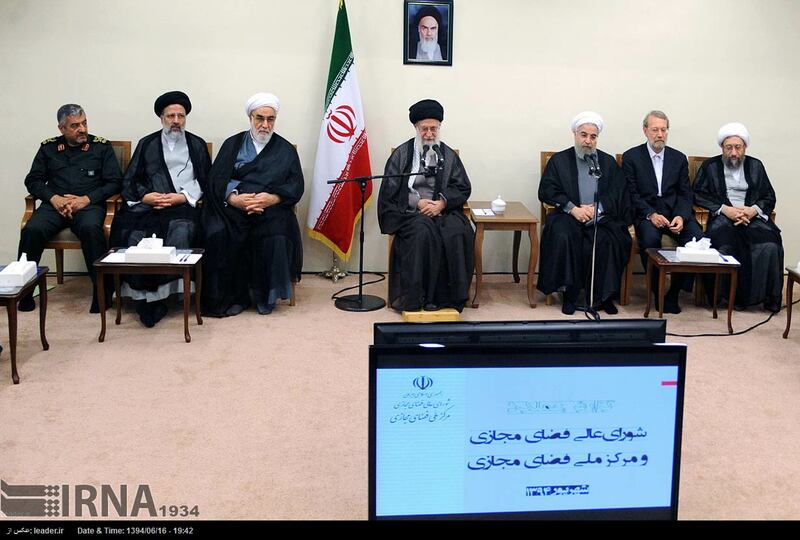 That may give the appearance that the government has the upper hand, but nine of the 17 government representatives belong to departments headed by officials appointed by Khamenei, tipping the council’s balance of power in favor of hardliners. So far none of the owners of messaging services being used in Iran have consented to the directive, which is unsurprising considering the fact that the Iranian government maintains and enforces a robust censorship regime on Internet traffic, routinely blocking and banning non-state approved content. Critics and civil rights activists are also regularly arrested for their online posts and handed long prison sentences on trumped up national security charges. Hardliners recently tried to increase censorship activities in response to the widespread campaigning that occurred on social media networks ahead of the February 2016 elections, which led to significant victories for reformist and independent candidates. Attempts to block access to Telegram during the elections were unsuccessful. The following weeks and months will reveal how effective or realistic Iran’s latest attempt to monitor user activity on the Internet will prove to be as the owners of social media apps decide how to react.